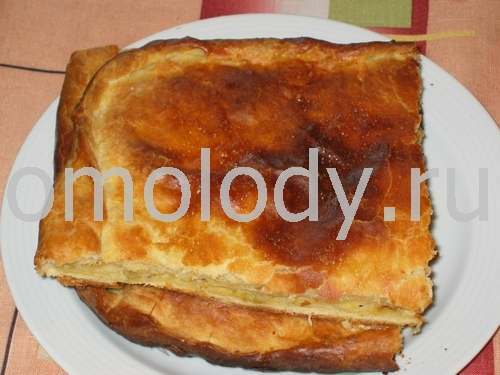 Cheese Pie. Recipes from Russia. 1. In a mixing bowl put flour, baking soda, all ingredients for crust and knead dough. 2. Refrigerate dough for an hour or two to chill. 3. Preheat oven to 350 degrees. Divide dough in 2 parts. Roll dough into desired crusts. Spread grated cheese mixed with fried onions over the crust. Cover with second crust. Bake for 25 30 minutes.